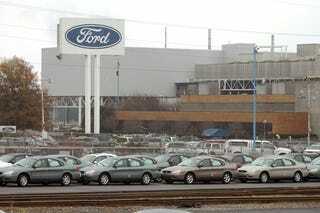 We Call Bull: Ford CEO Uses Wrong Word For Plural Of "Taurus"
At a Fortune magazine interview with Ford's Alan "Boeing! Boeing!" Mulally, the always-smilin' CEO used "Taurii" as the plural for Ford's Taurus car model. Unfortunately, according to Ford and the New York Times, he's wrong. On our way back from the semi-public interview at Time, Inc.'s "D Shack," a gorgeous home with manicured topiary purchased by the media conglomerate for reporting on the death of the city of Detroit, we called up two Ford PR staffers and asked them what Ford's official term is for a gaggle of Taurus. Each gave the same answer, telling me a flock of Ford four-doors is something to be avoided in press release as well as general use. "In general, we try to side-step the use of the plural of the name Taurus — using 'Taurus cars' or 'Taurus models' — but when we're forced to use a term, the correct usage is 'Tauruses.'" When I then asked whether a key executive using the word "Taurii" to describe a herd of large Ford sedans would be correct, I was told "No." Ford's not the only source claiming "Taurii" is plain bull. The New York Times wordsmiths tell us they've always used the term "Tauruses" to describe a school of the blue oval's best. Here's an example. By the way — in case you're interested — to describe the above photo of Alan Mulally's chauffeur-driven 2010 Ford Taurus sitting in a driveway of a house in Detroit with my Hertz rental 2010 Lincoln Town Car sitting in front of it, the correct term to use is "anachronism."